Does Draghi Have One More Treat Up His Sleeve? We have a jam packed session in store on Thursday as we get monetary policy decisions from three major central banks, as well as a host of important economic releases from across Europe and the US. The European Central Bank, Bank of England and Swiss National Bank will all conclude their meetings today, with none of them seen following their US counterparts and squeezing in one more change before year-end. Of the three, the ECB announcement will probably be of most interest as the central bank is now actively trimming its stimulus program and President Mario Draghi will deliver the latest macro-economic projections. With the ECB having only announced a taper to its quantitative easing program at the last meeting, it’s extremely unlikely that further updates will come today and I doubt Draghi will make any promises regarding the end of bond buying from September. That said, with the economic recovery gathering momentum, Draghi is likely to be pushed on this and may offer small clues on the next steps, for example the timing of the first rate hike and how the central bank will approach raising rates and reducing its balance sheet. I don’t think we should expect too much though as Draghi detests being perceived to have committed to anything. The BoE announcement should be a quieter affair, with the central bank not following up its meeting with a press conference. We will get minutes from the meeting as well as voting information, however with the central bank having only raised interest rates for the first time since the financial crisis last month, I doubt there’ll be much in these that will cause much of a stir. I still question whether the rate hike was inflation related or a move to get the rate back to what the BoE previously considered to be the lower bound, something that may become clearer as we see how much appetite there is for more rate hikes over the next year. 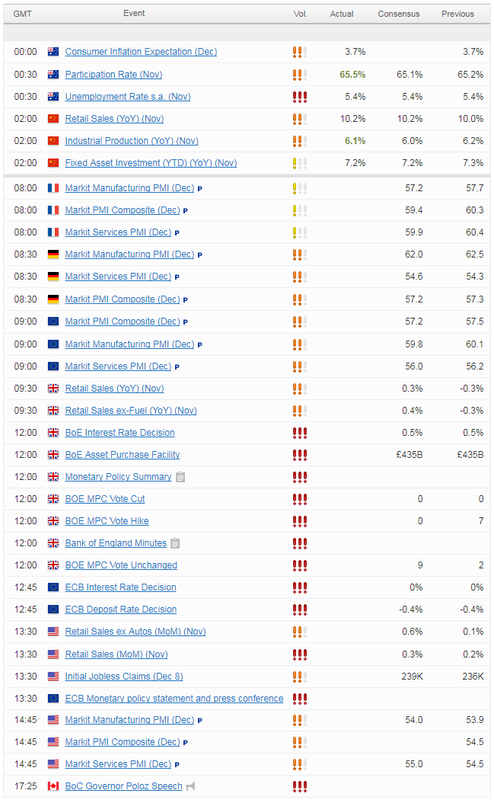 There is a lot of economic data scattered around these central bank events, with euro area, German and French manufacturing and services PMIs being released throughout the morning. These will be accompanied by retail sales data for the UK – an important indicator of economic health, particularly at this time of the year, at a time when the consumer is feeling the squeeze. This afternoon we’ll get both retail sales data and services PMIs from the US and hear from Bank of Canada Governor Stephen Poloz. Needless to say, it’s likely to be quite a volatile session on Thursday and that’s without even mentioning Bitcoin which has settled down since the CBOE futures launch.